Looking for roughly what it should cost me to replace my '96 993 front windshield. Also, any recommendations in the Pasadena, Ca. area? Glass is roughly $950 to $1000, install, probably about $200. some insurances have a $100 deductible on windshield replacement....even if the rest of your deductible is higher. had $1K deductible and after simply buying new windshields over the years when needed and paying for them...'found' that out when wife's suv needed one...ouch. otherwise...quad is right...$800-1000 for glass...another $100 or so for seals and install $1-200. Thank God (this time) for South Carolina - one free windshield a year with no deductible. I had the one on my 968 replaced a couple of years back, and they ordered a genuine Porsche replacement glass from Porsche, and the guy who installed it had won the annual International Master Fitters competition and he saved himself for jobs on the 'nicer' cars. It was like factory fitted, beautiful job. I replaced it earlier this year for $700 in San Diego, at a place recommended by my Porsche Indy. OEM glass is expensive. I just did this in my car and wanted OEM glass. OEM is about double the cost of aftermarket glass. Paid around 1,500 installed. After the install I had clearplex put on to protect it. My original windshield was fine but the pitting was driving me crazy since I looked through it every time I drove the car. You definitely want to go with a shop that's done the older cars before. There is an art to doing these so they don't squeak. You guys who have had windshields replaced...does the new rubber trim on the outside fit normally? Mine folds in the gap and looks pretty bad. Glass installer says that's normal and the best I can expect and suggested filling the gap with silicone. That last bit makes me think I need to find a competent installer to attempt to re-do it. OEM glass is expensive. I just did this in my car and wanted OEM glass. OEM is about double the cost of aftermarket glass. I was led to believe that aftermarket glass is no longer available. I checked a few months ago and couldn't find any. You guys who have had windshields replaced...does the new rubber trim on the outside fit normally? Mine folds in the gap and looks pretty bad. Is the glass properly centered in the frame with spec gaps? FWIW, I was told the aftermarket glass that is/was available doesn't have the radio antenna in it..something to check in to. Probably not, I don't think this guy is as experienced with 993's as he led me to believe. The trim has folded in on both sides and a few spots along the lower edge. It also creaks like hell and I think a leak has developed, going by the water coming out of my right side dash vent after rain and washing (good stuff!). If I can get out of work a bit early today I am going to swing it by a different shop (Euroglass). The way they were talking, they A) know these cars inside out, and B) already know what the first guy did wrong. Unfortunately, not sure if it can be saved. Moral of the story: pick your installer wisely! I took it to a body shop who lied to me and subbed out the work (and subsequently cost me about $4-500 more out of pocket than it should have). Was not a happy camper, icing on the installer is hard to pin down, although I don't think I'd want him doing it over again anyway. That's def not right. My car has a similar issue right now, as the previous owner took it obviously to a shop that doesn't know how to install windshields on these cars. Silicone is not the solution. My local glass installer confirmed my is totally not sitting correctly and he's done plenty of 993s. I'll be getting a new one probably next month as it took a rock hit a few weeks back, fortunately covered under my insurance. Now what would be some differences between OEM and aftermarket glass? I recall reading somewhere the aftermarket windshield may be even stronger. This is hear-say, but these are some potential differences I ran in to while researching last year. IMO, other than being more pit resistant, if anything else is true it's not worth it for a street car. This is very typical of a bad install. There is not much tolerance on the placement of the glass itself. Most bad installs I have seen usually have way too much Urethane, so much that its squeezing into the inside of the car (look between the rubber seal and the glass on the inside of the car, and bad placement so one part of the seal does not join up with the body correctly. Often as well, the installer breaks the plastic liner on the glass that is used to hold the rubber outside seal in place - you can tell this by pushing on various places on the seal, and you will feel "soft" spots. 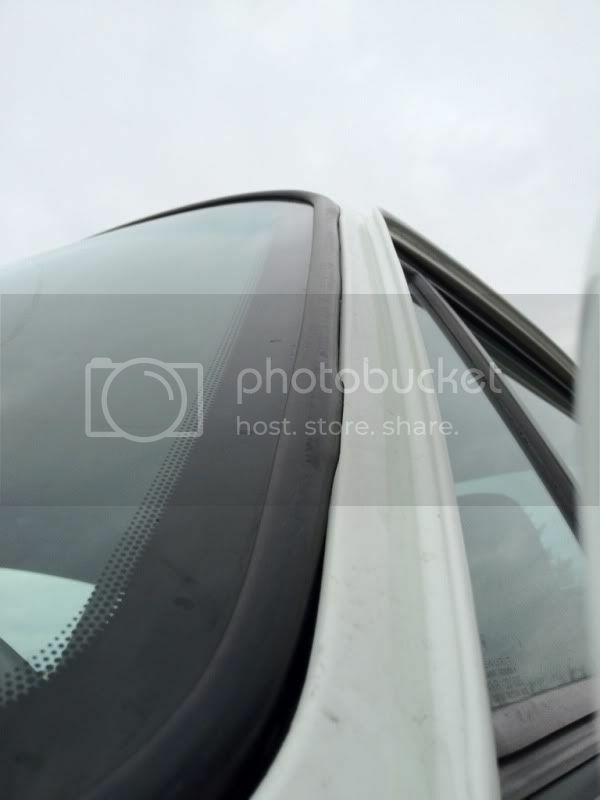 This also happens on the rear windows, especially on the lower corners - the plastic retaining strip tends to break at the corners, and you get lifting of the rubber seal at the corners because nothing is holding it down. If you glue it down, you now have another potential spot for water to pool (and rust). If you use a glass installer, ask how many times they have done 993's, and what technique he uses. There is installation specs in the shop manual which I doubt most installers have never seen.